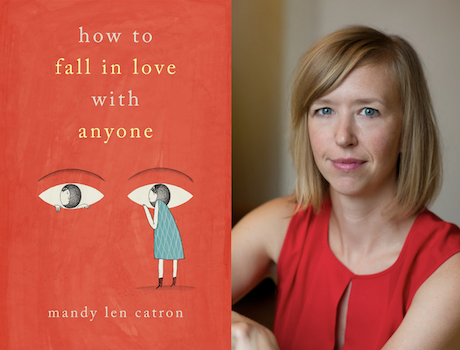 In 2015, Mandy Len Catron, creative writing instructor at UBC, published To Fall in Love With Anyone, Do This in the New York Times‘ Modern Love column. The column went on to be read by more than five million readers in less than a week. In her new memoir, How to Fall in Love with Anyone, Catron continues to unpack the complex stories we tell ourselves about love, pairing her personal experiences with solid research to explore the romantic myths we create and how they limit our ability to achieve and sustain intimacy. We spoke with Mandy about her writing, the extensive research she did for the book and how she utilized UBC Library and its collections in her work. Tell us about How to Fall in Love with Anyone and how it came about. I started writing the book at the Banff Centre in 2010, long before the essay came out the New York Times. I knew the Modern Love column had launched many books so I had a vague idea of sending them something one day. In fact, I didn’t write that essay until after I’d completed an early manuscript for the book at the end of 2014. I hoped that I might hear from a few editors or literary agents after the essay was published, which would make it easier to find a home for my book. As it turned out, I really underestimated the attention these now-famous 36 questions would get—and the essay opened all kinds of new opportunities for me, including the change to revise and publish my manuscript. Initially, I had envisioned the book as a memoir with lots of research and reflection, but I wasn’t quite sure how to organize it and what to do with all the information I’d amassed over the years. I started a blog, The Love Story Project, as a way to test out some of my ideas. And it was there that I came up with the central premise of the book: there is a gap between how we talk about love (with each other, in our families, in popular culture) and how we actually practice it. I wanted the book to explore that gap. The amazing thing about my Modern Love column is that my own love story became an illustration of this exact phenomenon. Everyone wanted to know if I was still in a relationship with the man from the essay—and they were content with a very short answer: yes. No one asked about how the 36 questions impacted our experience, or what it was like to see your relationship mentioned in international news just a few months after you started dating. But that, to me, was the more interesting story. So this gap—between the public idea of our relationship and my daily intimate experience of it—was a great starting point for a collection of essays. You did a great deal of research when writing the book. Can you tell us a little about the resources at UBC Library that were most helpful to you and how you used them? I’ve spent hours and hours on the UBC Library website, searching databases for research on everything from the evolutionary anthropology of romantic love to sociological theories of storytelling. So the best resource for me was the incredible collection of academic journals and the many databases UBC provides access to. My educational background is in creative writing, so I don’t think of myself as a career academic. But I do teach first year students how to do research, make sense of scholarly writing, and think critically about the production of knowledge, so it seemed natural to apply these same ideas to my creative process. It isn’t always easy switching between a scholarly, analytical point-of-view and a more personal, subjective sense of knowledge and knowing, but that’s the kind of writing I love to read and, increasingly, the kind of thing I like asking students to write. I’ve also used the library to borrow and read the kinds of love stories I think we need more of in the world—stories that expand our sense of what’s possible in love. And now I’ve been teaching some of these books in my classes. Right now, in my love stories class, we’re reading Austen’s Pride and Prejudice, Murakami’s Norwegian Wood, and Lauren Groff’s Fates and Furies, along with a bunch of scholarly and theoretical writing about love and storytelling. Can you shed some light on your writing process? Do you do your research first, then write? I do a combination of research and writing at the same time. I think of writing an essay as a process of collecting and evaluating information—and that information can be everything from scientific data to personal reflection. For me it’s a kind of cyclical, generative process: a personal experience will prompt a question, which will prompt research. For example my parents divorced and I wanted to understand why and how their love story had such a big impact on me. So I wrote about my struggle processing this huge change in our family. And then I researched how we use family narratives to construct identity. It turns out there’s a whole field called “narrative psychology”—which was amazing to me, and reading what folks like Jerome Bruner wrote on the topic helped me to make sense of my experience. I don’t write directly about narrative psychology in the book, but that research informed my thinking throughout the book—especially in the essays about my parents and grandparents. Who we are is so directly connected to the stories we tell about ourselves. And it continues like this: reflection prompts research, research prompts further questions, which yields further reflection. I think an essay can contain almost anything, which is what makes the form so exciting. Do you have a favorite spot or branch of UBC Library? The Irving K. Barber Learning Centre is right by my office, so I’ve spent some time there lately. I think best in rooms with big windows and high ceilings and Irving has lots of those, along with quiet nooks for reading. What are your reading right now? So many things! I’ve just started two totally different Canadian novels on love: Zoey Leigh Peterson’s Next Year for Sure and Jane Eaton Hamilton’s Weekend. And I’m halfway through two essay collections: Durga Chew-Bose’s Too Much and Not in the Mood and Scaachi Koul’s Soon We’ll All Be Dead and None of This Will Matter. I love them both for their really distinctive writing voices and amazing titles!